There are alternatives to using high street banks for converting and sending money abroad. One option is to use PayPal. More and more services are cropping up, and I’m currently looking into the advantages of using one over the other. Here are some others I’ve found. Sending money abroad is deceptively expensive, thanks to the hidden fees we’ve all been forced to pay. Now TransferWise lets expats, foreign students and businesses transfer money wherever it’s needed, at the lowest possible cost. No hidden fees, no headache. This is by far my favorite service. Currencyfair is the closest competitor to Transferwise and is also a great service. Check the rates given by both Currencyfair and Transferwise and choose whichever works out cheaper. You can sign up for a Payoneer card, and receive your payments directly to that card. As mentioned above, you pay a flat fee per payment received, and then the funds are loaded to your card within 2 business days. You can also choose to pay an extra $3 to have it loaded within minutes. The card is held in USD, and you can use it to make purchases online, in stores, and at ATMs worldwide. As a debit MasterCard card, all purchases in a non-USD currency are converted using MasterCard’s official exchange rates, which can be estimated here: https://www.mastercard.com/global/currencyconversion/index.html. A conversion charge of up to 3% also applies. If you don’t want the prepaid card and instead want to get paid directly to your bank account, you can sign up for this service. It allows you to receive payments directly to your bank account in over 200 countries. For more than 50 countries, we provide a local transfer solution. This means that funds are actually being paid to you from a local bank in your country, in your local currency. This eliminates any international transfer, and the extra charges associated with them. For the remaining 150+ countries we offer SWIFT transfers. You pay per payment, with costs starting as low as $2.99 per payment (depending on your country). You will be able to choose the currency of payment, and if currency conversion is required, we use the official market mid-rate (at the time of transfer), and a conversion charge of 2% for the six major currencies we use, which are Euro (EUR), British Pound (GBP), Canadian Dollar (CAD), Philippine Peso (PHP), Australian Dollar (AUD) and Romanian Leu (RON). For all other currencies, a charge of up to 3% applies. The Payoneer prepaid MasterCard works just like any other MasterCard. The card is accepted at all locations worldwide, wherever MasterCard is accepted electronically. You can use it at any point of sale location to make purchases, whether online or at retail locations. You can also use the Prepaid MasterCard at ATMs worldwide to withdraw cash. The Prepaid MasterCard may be used for online transactions wherever MasterCard is an accepted form of payment. The fees for withdrawing at an ATM are $3.15+3% of the withdrawal amount for currency conversion. Payoneer charges 1% of the payment amount when transferring to it. The yearly fee of Payoneer is $29.95 per year. Anytime money crosses borders or currencies, MasterCard and the issuing bank apply processing fees to the transaction. This is true of both POS (Point-of-Sale) and ATM transactions. When the Payoneer card is used for non-USD transactions, a currency conversion fee takes place based on MasterCard’s exchange rate, which is adjusted regularly based on market conditions. The processing fee charged with the Payoneer card can be up to 3%. Please note that currency conversion fees are charged by all banks, and the fees charged with Payoneer cards are among the lowest in the market. With all these options, you should also keep in mind that the two bank accounts can be set in different currencies. Be careful because with most banks, if you transfer an amount in one currency and the receiving account is set in another currency, that money will automatically be converted to the receiving account’s currency, thus incurring you a currency conversion fee and potentially an exchange rate which is not so good. To keep abreast of how the exchange rates are fluctuating, use Oanda, as I detailed in another post on this blog. As online workers, many of the transactions we make are conducted in US dollars. Since we then have to convert those dollars into our home currency (in my case Euro), exchange rates play a very important role and should be monitored carefully. I recently did some research about exchange rates offered by Maltese banks, when making a USD transfer, which automatically gets converted to Euro upon arrival in your bank account. Interestingly enough, almost all banks offered a rate 0.745 Euro for every 1 USD. Only HSBC offered a worse rate, giving out 0.741 Euro for every 1 USD. I’ve also included the PayPal conversion rate for reference. This might not make much difference on small amounts, but when we deal with a few thousand dollars the difference quickly adds up. I monitored the rates over a few weeks and HSBC consistently offered worse rates. I’m not entirely sure why there is this discrepancy and will try to investigate further. A great service for receiving and making payments is Transferwise, it’s cheaper than using PayPal or bank transfers. I always use Transferwise when making currency conversions, such as when I want to invest in UK property through property crowdfunding sites. Creative commons image courtesy of Debs. If you have a PayPal account that you regularly use for collecting payments, and your main home currency is not US dollars, you would do well to read on. Not too long ago, I had written about biding your time to get the best exchange rate possible when transferring your money from PayPal to your bank account. Soon after that, I discovered that there is another area of optimization which we should be aware of. My home currency is the Euro, so my bank account uses Euro by default. 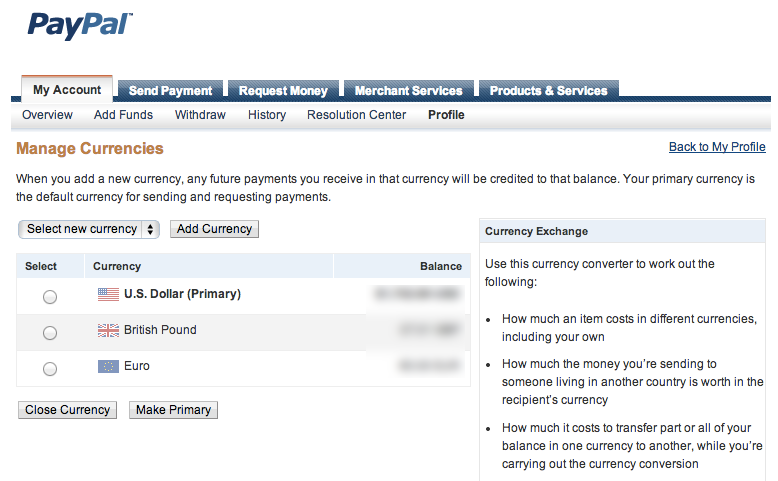 Online I collect payments in USD since that’s the de facto currency on the web. That means that when it’s time to get the gold home I am subject to conversion rates when changing from USD to Euro. This is precisely where many people lose a good chunk of money, so you have to be careful. Since your bank account is in Euro and your PayPal account is in USD, a conversion needs to take place. Now it’s a well-known fact that PayPal currency conversion rates aren’t the best, they incorporate quite a healthy profit for themselves here. 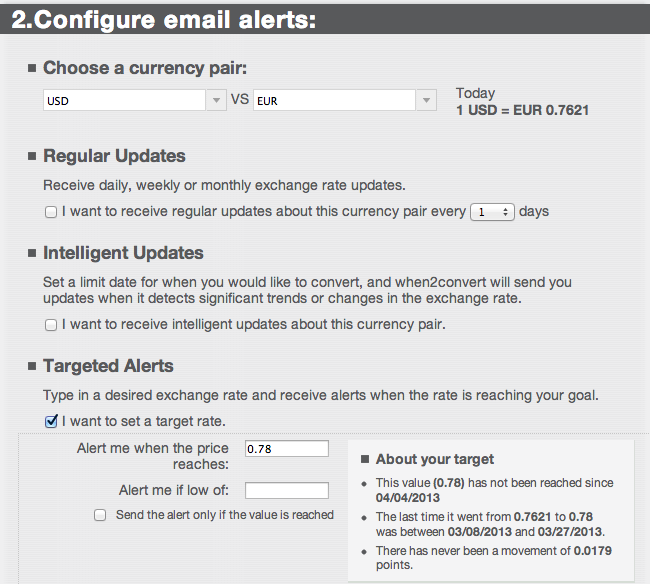 So it might actually be better for you to let your bank handle the conversion at their exchange rates. All you need to do is check out your bank’s exchange rates, make your calculations on how much Euro they would give you for a given amount of USD, then compare it to what PayPal would give you via their currency converter. Beware also that some banks charge an extra fee for currency conversions. My bank charges around 1 Euro each time there is a conversion. If you establish that it would indeed be beneficial for the bank to handle the conversion, you can change your PayPal account from being Euro based to USD based via this link. On a related note, you can check the net amount you will receive from a PayPal money transfer via this PayPal fee calculator. Sadly, it appears that the calculator’s formulae are a bit out of date as the net amounts didn’t exactly correspond when I tested it on my account. Note that if you have a Europe-based USD bank account, you will not be able to send USD directly from PayPal to that USD bank account. There will always need to be a conversion happening on the bank’s side, and the money will then go to your Euro account. As a test, I made a few transfers of $2,500 to my Euro based bank account just to test the difference in money between using PayPal’s exchange rates and those of the bank. Crazy huh? More than €44 difference on each transaction!! That’s around 2% more added cost on each transaction. Keep in mind that PayPal is already charging you $2.50 per transaction as a fixed fee. This is a post for all those of you who don’t have a US-based bank account but work online and receive payments via PayPal. At some point, you will want to transfer your PayPal funds to your local bank account so you can withdraw and use your hard earned money. However, you could be making a fundamental mistake during the process of withdrawal. Actually, I’ve been doing it myself for many years. I felt really dumb when I realized. As you know, exchange rates are always fluctuating, so your aim is to get the best deal when transferring money from PayPal to your bank account. Let’s say we want to transfer US dollars to Euro, which is what I do every so often. What I do nowadays is to first check the exchange rate, and also historical rates via this website. That gives me an idea if today is a good day to make the transfer or not. Looking back at the historical rates of the past 3 months, I then decide on a target rate I want to aim for. 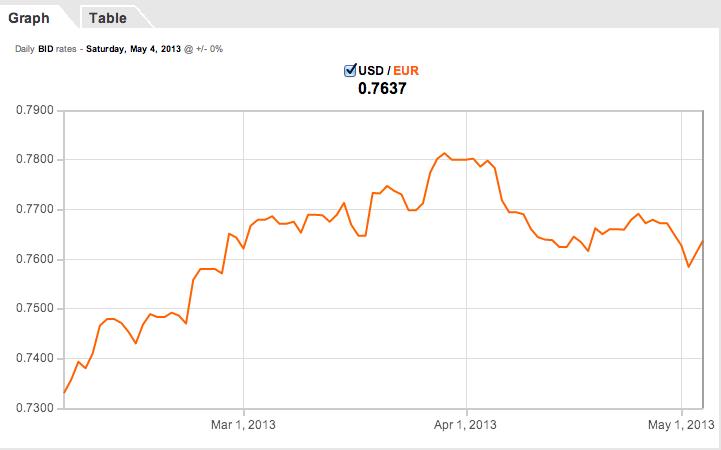 At present my target rate is 1 USD = 0.78 EUR. With that figure in mind, I then head over to XE and set up email alerts. Now as soon as the exchange rate climbs to 0.78 I will immediately get an email and that’s when I will make my withdrawal from my PayPal account to my local bank account. When2convert is an excellent service in my opinion, because it automates the whole thing and makes it very easy for me. Before I used to check the exchange rates every couple of days (every day is just too tedious), and sometimes I used to miss a good day. So I knew I need an automated shortcut of doing this checking. Luckily I found this site, and I hope you find it useful too. Update: I found a similar tool (also free) at https://www.specificfeeds.com/Free-Forex-Signal-and-Exchange-Rate-Tracker and there you can not only define strike prices, but you can select to get updated every time the EUR/USD rate changes by 0.02 points or so, so that it’s not a one-time notification, but you always know if there have been significant changes without spending too much time to checking it every couple of days. Do you have any other related tips you’d like to share? Let me know in the comments section below!